Salman Khan, who is currently busy in the shooting of Ali Abbas Zafar directorial Bharat, shared a pic on Instagram flaunting the tradition jacket of Arunachal Pradesh. 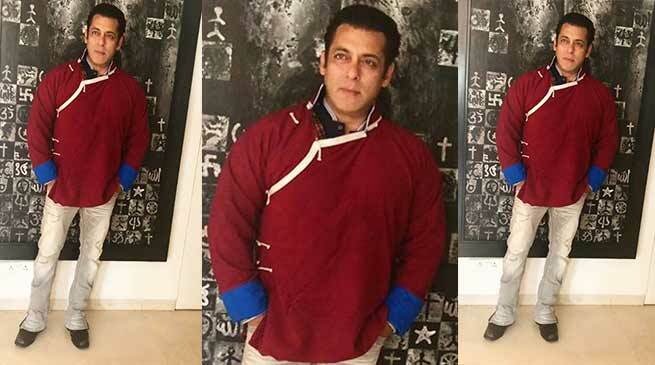 In the photo, Salman can be seen donning a traditional “Monpa” jacket of Arunachal Pradesh and sharing the maroon monpa jacket picture. Recently, Salman was also seen promoting his brother-in-law Aayush Sharma’s Bollywood debut film Loveyatri which also features Warina Hussain in lead role.